Did you recently move into a home in the Seattle area that is full of awful wallpaper? We can’t agree with you more in your decision to remove the wallpaper in order to apply a fresh coat of paint that can change the entire atmosphere. However, it’s also very important that you know how to properly remove the wallpaper before you start painting. Take note that our painters at Queen Anne Painting are more than prepared to remove the not-so-eye-pleasing paper and paint the room for you, but we understand if you want to prepare the walls on your own. If you are someone who’s willing to put in the work with a little bit of elbow grease, here are your steps. Prepare the surface by checking the wallpaper. You’ll want to see how affixed the wallpaper is to the walls. You may find that there are some loose areas of wallpaper, which you can remove using a utility knife. Before you start removing the wallpaper, remove all of the switchboards and nails that will stop you in your tracks later. You may want to lay drop cloths on your floor to avoid chipped paint falling onto your carpet or hardwood floor. Before you start removing the wallpaper, note: If your home was built in 1977 or earlier, call Queen Anne Painting for lead paint removal services. We highly recommend this because the paint used in 1977 and earlier frequently consisted of lead-based ingredients. If these ingredients are chipped away from your wall, and you’re not using proper disposal and protection methods, you could be exposing you and your family to lead. To remove strippable wallpaper, start with a putty knife to pry the edge of the wallpaper off the surface of the wall. If it pulls away with ease, you have strippable wallpaper, and your job will be easy. Continue to remove the paper by gently pulling at the edges of the paper with both hands until the entire strip of wallpaper is off of the surface of the wall. Repeat this process all around the room. If you run into stubborn wallpaper, you can usually get it off the surface of the wall with a razor blade knife. For easiest removal, hold the knife perpendicular to the surface of the wall and make a series of horizontal strips about 10 inches apart (or so). You should be able to loosen each section of wall paper and pull it free from the surface of the wall with your fingers. If you’re lucky enough to have purchased a home that has peelable wallpaper, you’re at an advantage. Peelable wallpaper is the easiest to remove; all you have to do is grab a corner and gently peel it back, just like a vinyl sticker. Stripper concentrate will be needed for this job. Follow the directions of your stripper concentrate, and apply the concentrate mixture to the walls with a broad brush. We suggest that you work from top to bottom, one section at a time because you don’t want the paper to dry before you have a chance to remove it. Once the wallpaper is wet, let is sit for a few minutes. After a few minutes you’ll start stripping it with a scraper. The piece should scrape off in pieces without much effort. Washable wallpaper may be easy to clean, but it can be an annoyance to remove. In order to remove washable wallpaper, you will need to break through the plastic film that protects the wallpaper. To do this, use a scoring tool to puncture holes in the wallpaper, but be sure you’re not puncturing the surface of the wall. Using a spray bottle, soak the wallpaper. To make your job easier, soak the wallpaper by spraying directly at the punctures you made. This way, the water has a better chance of working its way behind the covering. Wait about 10 minutes and begin scraping off the wallpaper with a putty knife. There are many different ways to remove wallpaper from the surface of a wall. 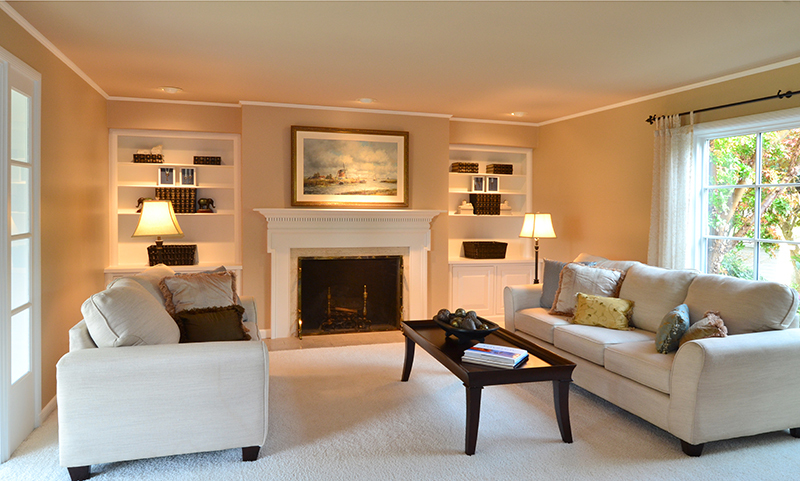 The easiest way to have this done is by calling the professionals at Queen Anne Painting. If you want more information about our painters and the wallpaper/lead paint removal services we provide, give us a call!